In a terse statement rumored to be released later today after a much anticipated indictment of Senator Bob Menendez is announced by the Department of Justice, Beth Mason is expected to follow she is resigning her City Council seat and leaving Hoboken. The statement may arrive on Mason's favored "news" outlets Hoboken411 and the Hudson Reporter as soon as today. Both publications are said to have held business relationships with Beth Mason favorable to if not hosting her political operations, offering positive coverage or conveniently no coverage at all when dark clouds circled the controversial Hoboken political figure. leaving council seat and Hoboken. Mason's political fortunes took cyclical often stormy rides with her enormous political expenditures underwitten by her husband, Richard Mason, a well to do lawyer for Wachtell, Lipton, Rosen & Katz's bankruptcy division. Recent events saw dark clouds hanging over the Masons as a civil lawsuit against more than a dozen Hoboken residents in 2012 was first rumored then alleged underwritten by them for political purposes to silence opposition to the controversial councilwoman and her Old Guard allies. After the case was thrown out of Hudson Superior Court last month, emails in the case became public between Beth Mason and her long time political operatives revealing to the Hoboken public a sick twisted pathology of lies and viciousness and turning them into total pariahs in the Mile Square City. Beth Mason's frequent public image problems were an almost constant occurence in her once aspiring political career. While thumped twice by Mayor Dawn Zimmer for the top seat at Hoboken City Hall, Mason's never say die political operations with numerous political consultants on the payroll always propelled her into controversy and the news. Mason was at the epicenter of speculation in the massive Data Theft Ring conspiracy (DTR) looting tens of thousands of emails out of the mayor's office and investigated by the FBI back in 2011. After months of refusals to answer about her involvement in the theft, she infamously announced in a live City Council meeting, "Unless there's proof, I'm going to say I didn't steal those emails." Later that same year, a threaded eye of a needle sale saving Hoboken University Medical Center was facing constant disruption by Beth Mason and her political operatives who worked feverishly inside and outside of Hoboken to see the hospital sale stopped and the 100 year old institution closed. The attempted sabotage outraged the Hoboken public as the City teetered on bankruptcy if the sale was not completed. Mason in the end outrageously claimed she and her Old Guard allies secured the sale in a last second save of face vote in an emergency council meeting. 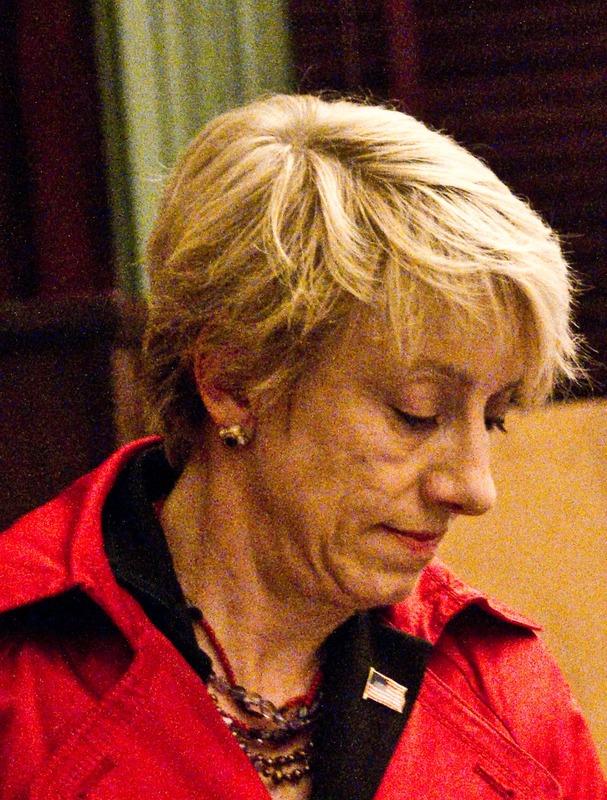 Last month in the Hudson Superior Court, Beth Mason's long time intimate political operative sat in a Jersey City courtroom as a judge noted evidence of Mayor Zimmer's stolen emails were found in his email account. The defamation case against a dozen or so Hoboken residents was abruptly thrown out of court mid-trial for lacking evidence. Previously, a well known paid Beth Mason thug escaped conviction for going to the school of a former sitting BoE official and screaming at her and her kindergarten aged daughter on school grounds. While escaping a finding of guilt due to a lack of conclusive evidence, a Union City judge presiding over the case washed his hands of the matter describing it as "Hudson County dirty politics." Mason never offered any apology to the Hoboken mom for the thuggish behavior of her employee. In 2012, a notorious BoE campaign sponsored by Beth Mason involved what was called the Nazi Truck. The truck ran a video flashing a Nazi flag tied to a fishing pole held by the owner of the once popular blog Hoboken411. Outrage at the display over two consecutive nights throughout Hoboken led to both local rabbis calling for an apology: one they would never see. Earlier this year, the Nazi Truck owner first revealed to MSV he was paid by Beth Mason's long time Weehawken based political operative and identified the other person with him as a Mason thug. With the anticipated indictment later today of Sen. Bob Menendez, a few last Mason dead-enders hoped the infamous Mason family checkbook would splurge one more time and make a run for his US Senate seat after his possible resignation. The Mason family has flooded Democratic political committee coffers across New Jersey and leverage was once thought possible to see her propelled if not out of Hoboken via elected office then through another less circuitous route. A neighbor of the Mason's however said all was not well at home. "Ricky is very unhappy with her and divorce papers are being filed," they said while asking not to be named. "All of this malicious court abuse stuff found its way back to his law firm and hasn't gone down too well. She'll be leaving Hoboken soon." Asked where Beth Mason may be heading, the neighbor said others on the block were surprised but pleased with the news and pointed to a small 11 room inn in Virginia that Mason purchased last fall. "The maid told us she's going to be living in one of the rooms at the inn. Ricky doesn't want to wait until a divorce, he wants her out." One soon to be unemployed political operative for Beth Mason summed up the sudden change of circumstances for his client saying, "What comes around goes around. She's done." Hoboken for the moment is waiting in eager anticipation.